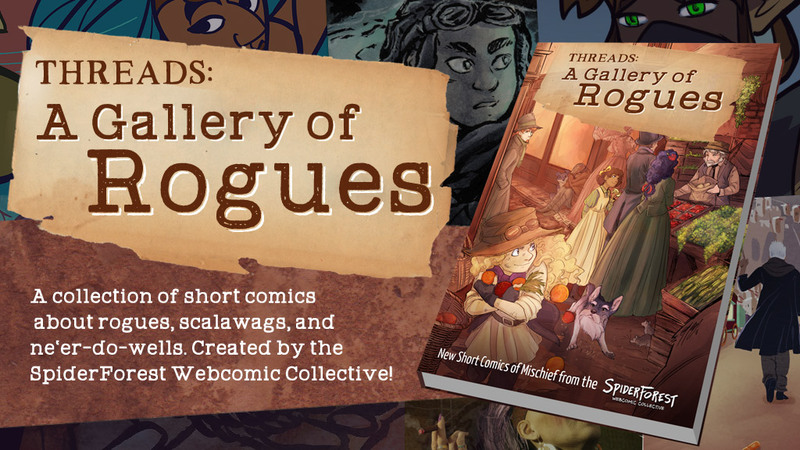 Not an update, but a chance to see what I've been up to: the Kickstarter for the SpiderForest Webcomic Collective's second anthology, 'A Gallery of Rogues' went live yesterday! For this year's anthology we were challenged to tell stories about our favorite rogues, and we ended up with 15 short comics about everything from elvish thieves to space pirates, outlaw mages to cyberpunk con men, demon pickpockets to trickster snakes. My own contribution, 'All That Glitters' features everyone's favorite short fuse, Darwin, and his terrible, horrible, wonderfully roguish grandmother. It's a lot of fun and I have been looking forward so much to getting it out there, guys, I can't even tell you. But I am back to working on the main comic again at last, and I am hoping to start updating sometime in the next few weeks. I'm still trying to get a scene done before uploading it because there are, in fact, things at the day job that have not lit on fire yet, and I'd rather not leave y'all in the middle of something while I am beating out flare-ups, but I should have one finished by the beginning of July at the latest. As always, thank you guys so much for your patience! I will be back on track as soon as I can. And in the meantime, Kickstarter! * There were several non-flame disasters also, mind you. The luck at the day job lately has been ridiculously bad.